Join a thriving community that includes over 5,000 graduate research students working across disciplines ranging from earth sciences to early childhood education. 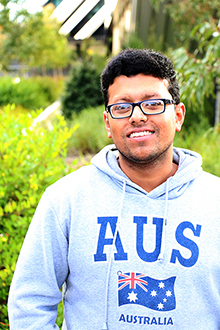 Monash offers a large range of research degrees, generous scholarships, expert supervision, world-class infrastructure and outstanding professional development. Graduate research at Monash will help you develop the expertise and skill needed to make an impact in academia, industry, government and the broader community. A PhD involves extensive, independent research under an expert academic supervisor. You will use your research to write a thesis that makes a positive impact to knowledge in your chosen field. These courses combine research, coursework and, in some cases, professional work or industry experience. While this is still a research course, professional doctorates are more focused on the improvement of professional practice. Professional doctorates are available in the areas of law, medicine, psychology and public health. A research master's degree is similar to a PhD, but the course duration and final thesis is shorter. These courses can serve as a pathway to a PhD. Join our research community and make an impact. The proud tradition of an original research project combined with innovative training options. Find out more. Authorised by: Chief Marketing Officer, Strategic Marketing and Communications. Maintained by: Study at Monash University Webmaster Team. Last updated: May 2018.